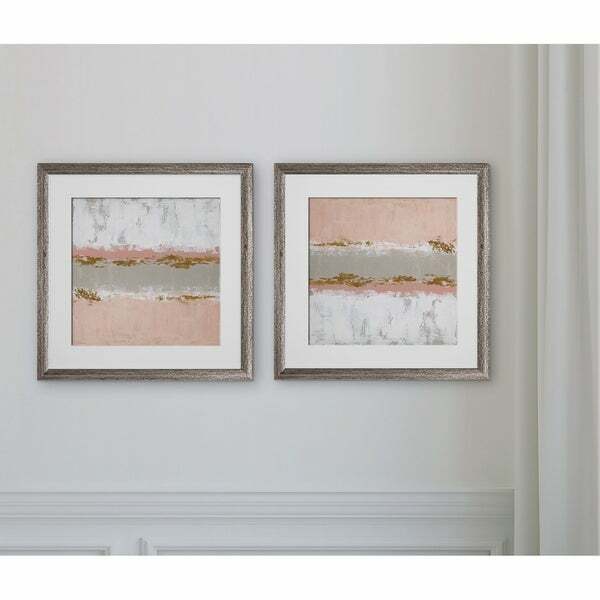 I purchased this 2 piece set to go with a pink and gray dining room that opens into a living room based on the same color scheme. I placed them near a large white marble counter top. I am so pleased that they blend right in. I wish that glass was used instead of an acrylic cover. I was careful to place the prints just right, so the over hanging lights don't distort the image. Glass is less likely to do that. I still love these and enjoy them very much. Sedona Sunrise -2 Piece Set 2 Custom Framed Prints. 100% and created to last. Individually printed and framed by hand to very high standards. Printed and inspected one at a time utilizing the latest archival UltraChrome Giclee inks Consisting of 2 Total Framed Pieces Each measuring 16''x16'' x .75'' deep Each Piece is Individually Framed Acrylic Glass Each piece includes hanging accessories and is ready to hang. You need only to apply an anchor to the wall of your choice. The colors and the style of the "Sedona Sunrise" framed prints are perfect in my remodeled powder room. The silvery gray frames are lovely. I gave only four points rather than five because: 1) the two prints are IDENTICAL, not complimentary, differing only in that one is hung with the white horizontal swathe at the top and the other with that swathe at the bottom; and 2) the "acrylic glass" is not as nice as actual glass would have been. But I paid only $32 for the set by using my Overstock rewards, so I feel that they were a good value. Loved these framed prints. Used them in my foyer area near the front door. They are exactly what I was looking for. They were priced great as well! I love these pictures. The colors are subtle and go perfectly with my gray comforter with pink and white accessories. I also love the frame color. The frame on this wood was much liter than I expected. If you like that white washed look then it will be good for you! The print is nice and the colors are as shown in the photo. The pictures appear good quality and are trendy. I was expecting them to be more of an orange tone, but they have a slight pink tint. They should go fine once out in my room with other orange accents though to help pull that color out. Purchased these for my guest bedroom. They go with the decor perfectly. Would highly recommend. The pictures look exactly as pictured , as far as color goes. However i'm very disappointed in the size of them. The advertisements portray them to be large when in fact they are small frames. I will not be able to use as intended., i'm on the hunt for another set of pictures. Bought these to bring more “pink” into my daughters bedroom. The colors are perfect, but the gold foil looks more like brown - I was expecting a shine, and it’s a matte finish. Overall a nice addition to her room. "Does the whole picture including the frame measure 16x16? Or is it just the picture and then there is additional frame?" "What colors are in these. I can barely tell. I am looking for more of a coral color. Thanks"
For my new office - LOVE these!